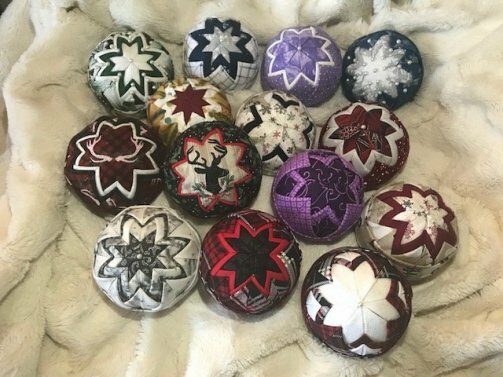 Join Nichole Hruska to create fabrictastic Christmas ornaments. Tuesday, November 21st. 1:30 till close (5:30). Please allow at least one hour to complete the project. Class fee will be $10.00 per person to cover supplies. No preregistration necessary. These balls will surely brighten and add character to your tree. You will leave class with a quilted look ornament ball and an imagination of possibilities. Pins and styrofoam balls will be provided along with hot glue. Please bring at least three or four 6’’ width of fabric strips, rotary cutter, ruler and a thimble. No need for your sewing machine for this class. Contrasting colors work best but please feel free to have fun with your fabric. Fabric does not need to be Christmas. I personally love fabric with a bit of metallic, who doesn’t love a bit of sparkle in their life.